Pirate101 released yet another sneak peek today! This one is awesomely spooky! It shows a stone room with a big ol' cauldron of bones in the middle. There is also some fires in the background and a purple light that looks like it may be some type of passage to another room or area. 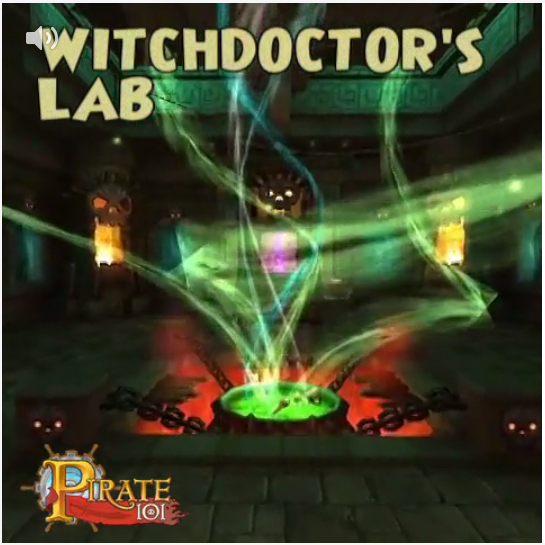 My first thought was possibly some type of crafting, because of the name "Witchdoctor's Lab". Some people are speculating a bundle with a Witchdoctor themed house. Or maybe it's just part of an epic new quest. I cannot wait to see what the new Pirate101 update will bring to the game. I have a feeling there will be lots of new content. I am so excited to see how this fits in with the bigger picture. Be sure to check out the link above to view the whole clip. Also, comment below and let me know what you think the Pirate101 team has in store for us! Are you as excited as I am?